Colour: Pale gold (like Riesling Spätlese - late vintage). Nose: Clean and fresh on the nose with delicate notes of yellow fruits - peaches, apricots, pineapple and subtle ripe apples. Flavours of vanilla and honey with tender lemon curd and a hint of mint arrive, followed by a slightly floral note. The high alcohol content is noticeable but not pungent at all. 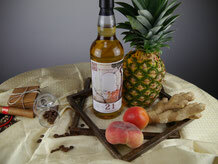 Palate: Bold, rich and sweet on the palate with lots of peaches, apricots, mango and pineapple. Very exotic. This is complemented by a warming spiciness of white pepper, oak and candied ginger, support by an alcoholic bite. Becomes drier with a touch of espresso notes, tobacco leaves and a not unpleasant hint of damped wood towards the finish. Significantly more spice with a second sip. Finish: The finish is long, lingering sweet and fruity. Notes of malted barley with acacia honey, spiced oak and a touch of bitter orange on the tail. With water: There's more yellow fruit coming through with a splash of water, supported by oak spice and white pepper. Creamy even oily on the palate with lots of fruit, nicely balanced with oak, ginger and pepper. The alcohol is significantly tamed. The finish is medium to long with creamy notes of vanilla and honey, followed by dry oak and hints of tobacco leaves. Comments: This new expression from Whic is a completely different Aberlour. Not, as is usually the case, matured or finished in sherry casks, but this time from a pure ex-Bourbon hogshead. And this is reflected in a wonderfully exotic fruit composition that is in good balance with spices, oak flavours and even some tobacco notes. The high alcohol content is of course noticeable, but with a few drops of water, this 21 year old Aberlour becomes a creamy oily fruit treat. Truly a summer whisky. Nose: Clean and lovely fresh on the nose with citric notes, peaches, apricots and subtle green apples coming through. Very attractive with a hint of barley sugar, lingering spiced oak and a touch of cloves in the back. Palate: Mellow and deliciously fruity on the palate with lots of pears, peaches and lemon. This is complemented by spiced oak, ginger and a slight touch of white pepper. Sweet and warming with acacia honey and a not unpleasant hint of damped wood towards the finish. Finish: The finish is long, lingering sweet and fruity with pear drops and a warming peppery spiciness on the tail. With water: There's more yellow fruit coming through with a splash of water, supported by lingering toffee. The fresh citric notes are slightly tamed. Very fruity and creamy on the palate. Very soft with a significantly tamed spiciness. The finish is a bit shorter but stays sweet and creamy, becoming slightly dry on the tail with oak and clove. 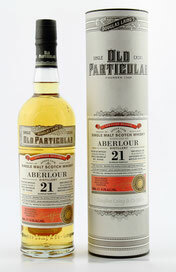 Comments: This nice 21 years old bottling of Aberlour is packed with delicate sweet fruit and lingering spices. A pleasant and refreshing dram, showing good balance and a lovely fruity core. A fine opening dram for the evening. Aberlour from a bourbon cask: indeed different, but quite a savoury alternative to the heavily sherried treats from this Speyside distillery.